Sunday, May 15 was Día del Maestro in Mexico. In Oaxaca the day honoring teachers was marked by the teachers of Sección 22 marching back into the zocalo, setting up their tents, and installing the ambulantes (vendors) under their protection. Sunday night and again Tuesday night, Tlaloc unleashed massive thunderstorms on the city. Despite weather, dwindling support for the union (93% of schools are reported to be open), and threats to strikers of being fired, the occupation remains and a federal police helicopter makes its daily low-flying circle of the city. 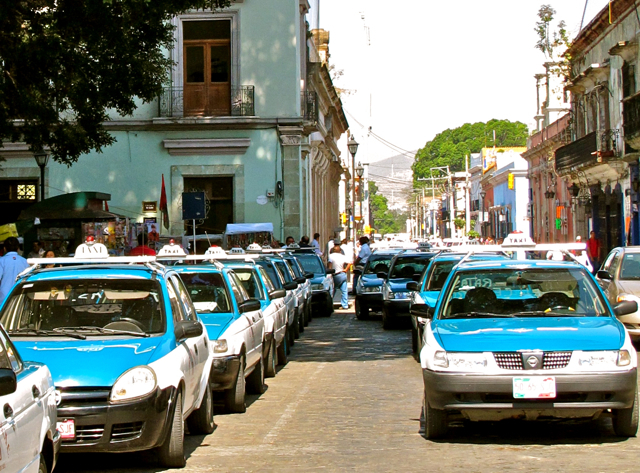 Lost in the hoopla re the Morelos movie filming… another strike by taxistas. Apparently, the issue of unlicensed taxi drivers (see April 6 post), still hasn’t been resolved. 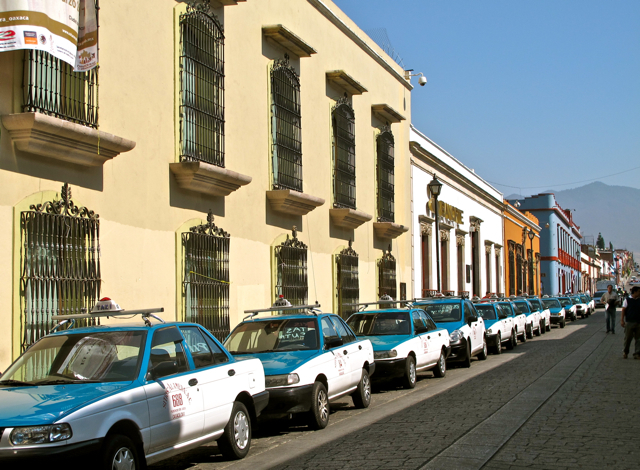 And so, on Wednesday, the streets surrounding the Government Palace were blocked by a rainbow of taxis, whose drivers are members of Integrantes de la Unión de Taxistas del Estado de Oaxaca (UTEO). On Thursday, the blockades were withdrawn as negotiations with the governor’s office resumed. Hopefully, the issued will finally be resolved, as taxis play an indispensable role in transporting residents, workers, and tourists from here to there. I sure hope no one needs a taxi in el centro today. 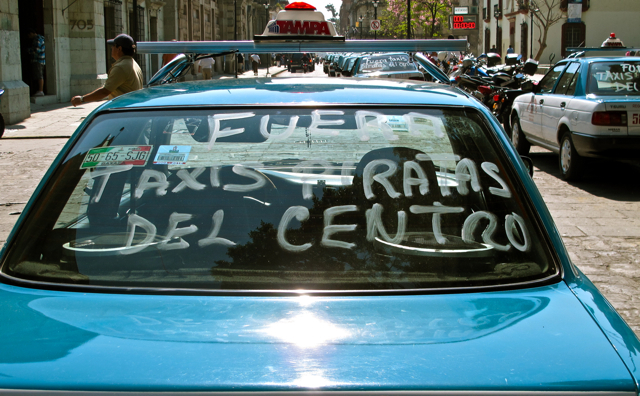 A protest against “pirate” taxis. By the way, pink taxis, lavender taxis, and green taxis were lined up on other streets, which would have added more color to this entry. But, alas, I violated the first rule of photography: Always carry an extra battery! I know, my feeble excuse of, I’d only gone out to buy velcro adhesive for my mosquito screen door project, is no excuse.